Recently I have been hearing lots of people researching the best Christmas lights in town, so this week is all about where to see the best holiday displays around. Drive through light displays have become the rage especially with families of small children and the elderly. What could be better than cruising through from the comfort of your heated vehicle? Well, climb aboard the Great Raleigh Trolley and have someone drive for you! Pick an evening between December 1st and 30th for your own private holiday light tour!!! You can enjoy a variety of Christmas displays while enjoying holiday music. There are family friendly options as well as those catered towards adults. Downtown Holiday Lights & History Tour – This tour will stay in downtown Raleigh and include some Raleigh history lessons along the way! We will visit staples such as Historic Oakwood, The Governor’s Mansion, and the City of Raleigh’s Christmas tree in City Plaza. This tour will be family friendly and last approximately 1.5 hours. Griswold Holiday Lights Tour – This tour will cover more asphalt in an attempt to show you all the best, big light, displays across Wake County! This tour will be family friendly and last approximately 2 hours. Downtown Holiday Lights & Nightlife Tour – This tour will stay in downtown Raleigh, covering all the staple, must see Christmas displays in the capital city, as well as stops at some of the most popular nightlife destinations. This tour is only available to 21+ and will last approximately 1.5 hours. The tours begin at Isaac Hunter’s Tavern at 414 Fayetteville Street. Parking is available at the many city parking decks nearby, as well as the Alexander Parking Deck (entrance – 120 S. Wilmington St.). Please arrive 30 minutes before the tour’s departure time and feel free to bring along your favorite beverage to take along for the ride. And if you love the Trolley, don’t forget about The Santa Express. Kids and parents hop aboard the Great Raleigh Trolley for a ride with the guest of honor himself…Santa. The Big Guy in Red will visit with each kid personally on the Trolley to review their wish list and pose for pictures. Lisa Skumpija can help with your Pittsboro, Chatham County and greater Raleigh, NC real estate. Living in Pittsboro, North Carolina and working onsite at the Chapel Ridge, Pittsboro, Fred Couples golf course community makes Lisa your local Chatham County real estate expert. Whether you are buying or selling a home in Chatham County, NC, Lisa Skumpija is a leading real estate agent and can make it a smooth process! 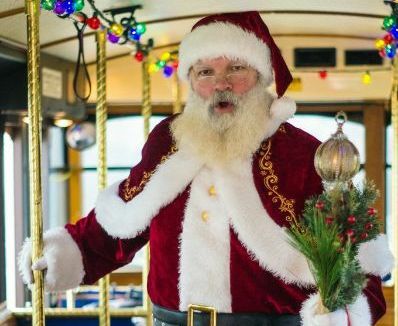 Visit the Great Raleigh Trolley website to schedule your family ride with Old St. Nick himself.